Congratulations to Samuel Haslett from Care first for being named September's Apprentice of the Month! He will be receiving £50 in high street vouchers. "At Care first Sam supports the systems that our 65 counsellors and hundreds of remote staff depend upon. Working in an environment which minute by minute deals with distressed people requiring counselling it is critical that our IT does not fail. Sam is very knowledgeable about all that is needed to keep our systems operating effectively and can think through issues and problem solve. He is patient and responsive when assisting his non- technical colleagues. Sam works hard and has been required to exercise self-motivation. With his manager on long term sickness absence Sam has willingly picked up additional responsibilities to do his absolute best to support his absent manager and our business. On top of this he has committed in an admirable way to the Apprenticeship. Outside of his day job, he works diligently and makes time to learn new material. It is important to him and to our organisation that he succeeds in this and he is putting in much personal effort. We have been impressed by how Sam has handled his studying commitments, the demands of his daily work and the thoughtful way he has used his initiative assuming extra duties in keeping our IT effectively operational." We would also like to say a big thank you to everyone that nominated, please see below! In the short amount of time Alex has been at the Bailey Group she has made a huge difference to both the marketing department and the wider organisation. From day 1 Alex has displayed a positive attitude and can-do attitude and has taken on every task with commitment and enthusiasm. The marketing department is very new to the Bailey Group so it can be challenging to get other members of staff to buy-in to the initiatives we have put in place, however Alex has dealt with the challenges of this in an extremely mature way. Even when faced with difficulties she has shown maturity beyond her years. In terms of her ability Alex has shown a marked improvement over the past three months, when she first arrived she already had an innate understanding of marketing however, since then she has shown incredible improvement and is now displaying a level of skill far beyond her three months of experience. Alex has so far worked on a wide variety of projects and I’ve been particularly impressed with her versatility and how she is able to move from one task to another seamlessly – which is an essential skill for an in-house marketer. Since joining our Technical Support Team, Callum has consistently exceeded our expectations at every turn. 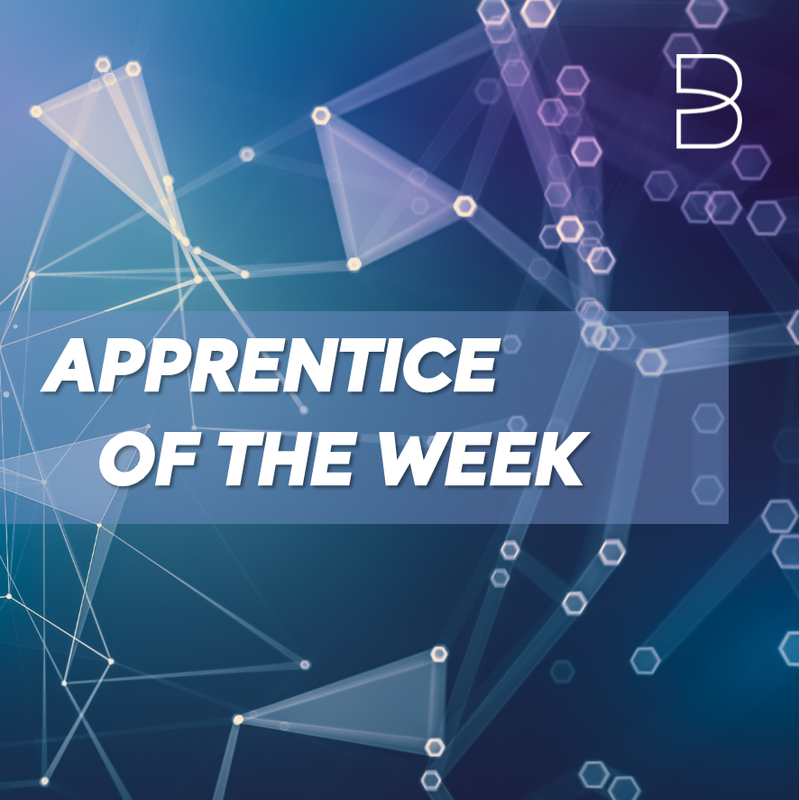 His integration into the team has been almost effortless, quickly demonstrating from the beginning that he is keen to get involved alongside his colleagues and learn all aspects of the role. Callum takes to all challenges with enthusiasm and a positive attitude. Listening to instructions from others and applying lessons learned to new situations. We have watched him grow in knowledge, experience and confidence from day one. Always conducting himself in a professional and courteous manner with both colleagues and customers at all levels of the business, Callum has quickly become a highly valued member of our team. He consistently produces a high quality of work, accurately and efficiently completing each task to the best of his ability. He has frequently shown that he is not afraid to independently have a go at something new but also willing to ask questions and seek guidance or assistance when unsure. We have been so impressed with Callum from the start, already he is far in advance of where we expected him to be at this point. He is our first apprentice but has set the bar very high for any that follow him. Josh has recently completed work on a new module of our online management system which incorporates an online training module, reporting and management suites. His approach to the work has been methodical and he has not only understood everything that we are trying to achieve but has brought his own problem solving skills to the fore and added his own touches to the final module. He has then trained colleagues on how to use the module and ensured that debugging has been thorough and effective. On top of that Josh has included testing feedback and client input into moulding the new module he has developed and achieved all of that whilst still completing his apprenticeship work to such a high standard that he has achieved on several occasions marks for the standard above which he is supposed to be working and consistently achieved distinctions across the board. Josh has now been with us at Handsam Ltd for 10 months and he has developed so significantly that we have now offered him a full-time job at the end of his apprenticeship in November. We are delighted to say that he has accepted. A wonderful example of how the Baltic apprenticeship programme can lead to a full-time job. Since joining the Internal IT team at Partnerize in October last year Jeevan has firmly established himself as a dependable, well respected member of the department. Taking ownership of all anti-virus alerts and ensuring they are dealt with in an appropriate and timely manner. Setting up and maintaining all meeting room space equipment across the entire office. This included creating a process documenting all tasks involved in the daily check of these spaces. Contributing several documents that are now used in our user facing knowledge base. Conducting an equipment audit which was complex task requiring a lot of attention to detail. As well as Jeevan’s day-to-day work, he has also made time for his studies. In his spare time, including his own lunch break on occasion, Jeevan can usually be found at his desk working though practice exams or going through notes he has taken during a training session. Jeevan has demonstrated a level of maturity and good humour well beyond his years and as a result is very highly thought of by everyone at Partnerize. We firmly believe that for all the reasons above Jeevan deserves recognition as Apprentice of the Month.